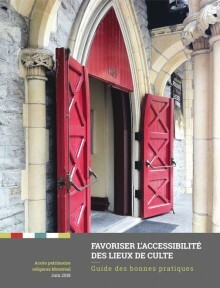 This guide produced by the Archives Committee of the Conseil du patrimoine religieux du Québec with the financial support of Bibliothèque et Archives nationales du Québec, addresses the major issues surrounding the rights and duties of archivists, institutes and researchers towards the archival heritage of religious communities, custodians of unique and tangible heritage.It aims to equip peers already trained in the multiple tasks inherent in the management of active, intermediate and definitive archives, and to make researchers aware of the context in which archivists must work. This guide aims to promote the accessibility of places of worship by providing the actors responsible for their cultural vitality. It supports the goal of raising public awareness of the richness of the religious heritage by promoting its appropriation and it focuses on an opening in all simplicity, to encourage new implications, especially communitarian, in a context where the religious heritage gains interest in the touristic and cultural plan. 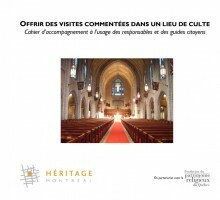 The publication of this guide is an initiative that originated at a coffee-discussion held on March 16, 2018 in Montreal, at the instigation of the Religious Heritage Table of Montreal of the Council of Religious Heritage of Quebec, in the continuity of the publication of the Ulysse Montréal travel guide, a religious heritage to discover. It was possible thanks to the rich contribution of the coffee-discussion participants, who also supported the name "Accès patrimoine religieux Montréal" to gather the group initiatives expected for the future. Offer Guided Tours in a Place of Worship. Accompanying Booklet for the Responsables and the Guides. Scattered throughout Montreal’s neighbourhoods are places of worship that are wonders to behold and that reflect the city’s history and cultural diversity. They’re attracting more and more attention from people and prompting parishes and congregations to think about how they can better receive visitors and interpret the building’s history. It's not always easy to tell the story behind an inscription, a marquee, a stained-glass window, a painted vault, or an ornament atop a steeple, but such story telling can enhance not only the building’s value, but also all of our heritage. It is in this spirit that the guide is offered to officials of places of worship and to citizens so that they can, with the help of sound advice and concrete examples, better share the pleasure of knowing our heritage.